Gadadhara, the potency of Gaura, is immersed in love for Gauranga. He feels great separation from the Lord of his life. Due to this, his heart is flooded with tears from his eyes and he continuously laments, seeing the entire world as vacant. He broke his promise and renounced his service – these two faults happened on the strength of his intense love for the Lord. Where is the strength to bear such agony of separation? Just by remembering it the heart feels pain. 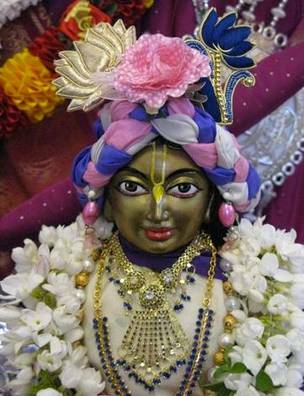 Pandita Sri Gadadhara Prabhu is Sri Gauranga’s own potency and the very personification of radha-bhava. His effulgence has now entered into the eternal pastimes, and everyone is immersed in the darkness of a moonless night. Whatever he does, whatever he says, wherever he moves about and looks around – who can describe his divine madness? Only one whose heart is surrendered to Sri Gadadhara can understand a fragment of its essence. Tears from his eyes constantly cover the verses of the Bhagavata, due to his state of divine madness arising out of prema. Hearing Gadadhara’s recitation about the loving pastimes of Gauranga, Sri Tota-Gopinatha is completely filled with happiness. Srinivasa Acarya, mad with divine love, came to the side of Sri Gadadhara Pandita; when he saw the sacred texts, he wept incessantly and again and again embraced him, knowing him to be a great ocean of divine love. Gadai is such an incomparable ocean of prema. He is Radha Thakurani Herself. 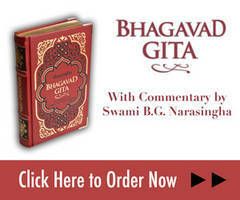 If you are merciful unto me, then I will realize the service of Sri Sri Guru-Gauranga. I will be enriched by the wealth of the love of Holy Name. One cannot recognize a Vaisnava by his external appearance and dress – as an acarya, he taught us this by his own example and begged to receive mantra-diksa from Srila Pundarika Vidyanidhi. By hearing this pastime, one can be rid of offences. The gaura-prema of Gadai is like that of the Jambu River that flows through Jambudvipa. What can I understand with my immature intellect? My mind is attached to material possessions; it is always being deceived by lust and anger and it is devoid of any desire to please K®sna’s senses. Tota-Gopinatha, sitting in padmasana on a jeweled throne, is always accepting the service of Sri Gadadhara. If one does not serve Gadadhara day and night, what else will give any benefit? The Lord of Gadadhara’s life is my Gopinatha. By the mercy of Gadai, one can attain Him. O Gadadhara, if you show mercy to me, Gopinatha will look towards me. Without you, there is no hope. All glories to Gaura-Gadadhara and Radha-Gopinatha. Please be merciful to me and accept this fallen soul as Your own.